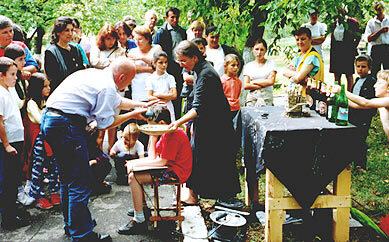 at the Singeorz-Bai Sculpture Symposium, Romania, August 2002. 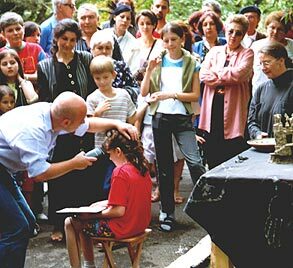 For the opening of the Sculpture Symposium, we did the performance 'A Rite of Passage'. 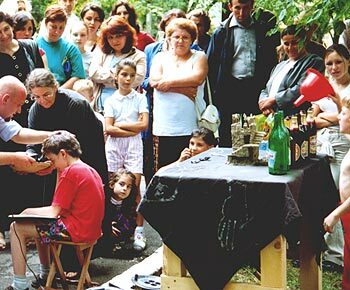 Here my long-haired 11-year-old son sat while Tudor Cordos cut all his hair off. At first the crowd wanted him to stop, but later they were encouraging him to do a better job! 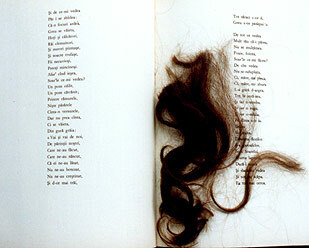 Toroa is at the point of moving from childhood to adulthood and the cutting of his hair, which I then collected and spread out onto successive pages of an illustrated book of Romanian folk tales, symbollised this passage. 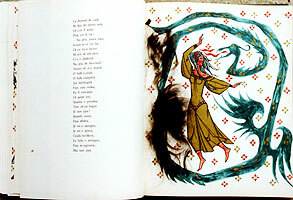 The book was a book of traditional Romanian children's folktales. After each 'rain' of hair was poured onto the pages, Toroa turned the page, symbollizing his part in moving from the world of the child on to that of the adult. 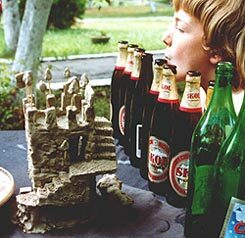 During the half hour performance, Tamatea, my 8-year-old son, played at the table behind us, filling bottles with water and blowing over them to create the sounds of childhood. He measured the water in the bottles by eye and judged the sounds by ear. He continued in this activity until he was satisfied that this arrangement worked well as an musical composition. Afterwards, this elderly man, who we had met a number of times, came to our performance dressed in traditional costume and so it seemed appropriate to make a photo session of the three generations of men. With fire we test the gold, and with fire we test Our servants, wood, 2002. Certain Measures, engraved and painted wooden rods, 1993 - 2002. Tulips from Istanbul, ...to come..., 1997 - 2002. Wrapping for a Marginal Citizen, ...to come..., 1994 - 2002.